The best apples come from farm stands, and so do the best pies. Mile high and loaded with crumbly topping, this pie will give you that farm fresh flavor, right in your own kitchen. Brought along to a pot luck, or served on your holiday buffet, everyone will want a second slice -- and the recipe. Make the filling. Toss together apples, brown sugar, lemon juice, spices and flour in a large bowl. Set aside. Make the topping. In a medium sized bowl, mix together the flour and sugar. Using a pastry cutter or your fingertips, blend in the butter, until coarse crumbs form. Remove the crust from the fridge and pour apples into it. It will seem like a lot of apples for that size pie, but they shrink while baking. 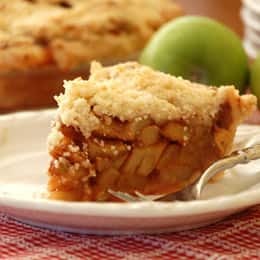 Carefully sprinkle the topping on the apple filling, covering the entire pie to the crust edges. Place pie on a parchment-lined baking sheet and bake for 45-55 minutes or until the topping is golden brown and the filling is bubbling. If necessary, cover the crust during the last few minutes of baking to prevent burning.